I have so far been struggling to find good pies in my local area in Gloucester. 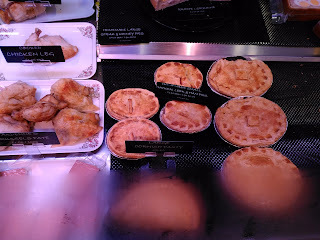 I was therefore quite pleased to realise that Farmhouse Deli in the city centre sell pies that they make themselves. Farmhouse is an upmarket butcher/deli shop, primarily focusing on meat. They have a shops in Gloucester and Cheltenham as well as outlet in Gloucester market. I quite liked the range of things on offer, they do gluten free sausages/burgers as well as tasty Single Gloucester cheese which is unique to the local area. The staff seemed friendly and interested when I explained about Pierate and my new mission to find the best pies in Gloucestershire. There is a good selection of traditional pie flavours with both family sized and individual sizes available. Having been in a few times I have found that not all flavours of pie are available all the time. You just have to go with the flow of what they have. Whilst the flavours might seem a bit unoriginal compared to some of the top unusual flavours of pie we have tried, as we often say, our favourite flavour is still steak. So with that in mind, I started off by picking up an individual steak and ale for £2.40 (or you can get 3 for £6.75). Given that you have to cook the pie at home and hence wait for it to heat up I also go a Pork pie at £1.80 to eat while I was waiting! Again it was one of those frustrating occasions where the pie could have been available hot but wasn't. I will try not to hold this against them. The Pork pie was up first and it looked really great in my opinion. It had a deep brown colour and a nice curvy crimp. Unfortunately looks can be deceiving as this pie wasn't quite as good as the hot meat pies, despite looking better! The pastry was generally pretty good, it was nice and crunchy which is my preference for a pork pie. The pie was well filled with porky goodness with only some small gaps around the edge. 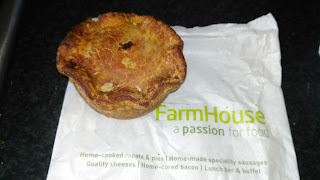 It was pretty big for an individual pie so the price of £1.80 compared favourably with upmarket supermarket pork pies. Sadly, the filling didn't quite do it for me. I found it overly salty and fatty which meant it became a bit sickly after a while. In fact I didn't fancy eating all of it in one go, I only had half which isn't a good sign. There were also some bits that were too chewy. In general I thought the filling could have had a better texture, it was in one solid, processed lump. Next up was the Steak & Ale, one I was anticipating to be good given the smell coming from the oven. It also looked good with a lovely, glossy glaze. Unfortunately I think perhaps I hadn't cooked it for long enough (it didn't come with instructions). The pastry tasted a bit like the ready made pastry that I often use for my pies at home. Whilst under-cooked in some places it was nicely crunchy at the edge. The filling was strong with a decent amount of steak. The pieces of steak were flavoursome as you might expect from a butchers but they could have been a bit more tender. It is a difficult balance to get right because it is quite satisfying to have something to get your teeth into. 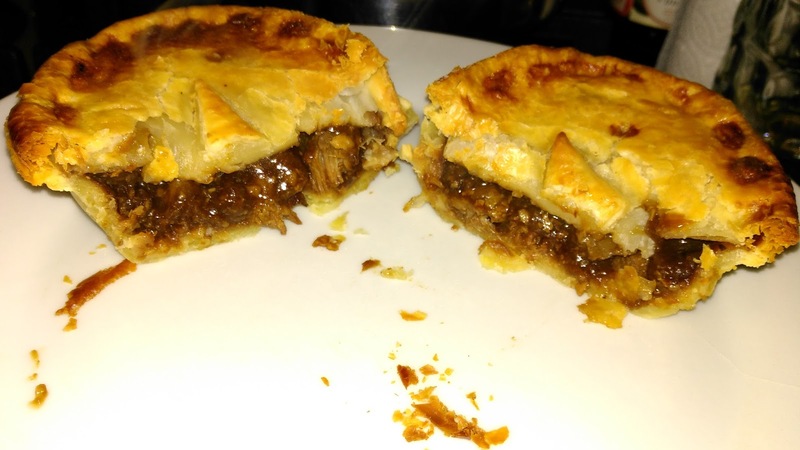 The flavour to the gravy was that of a fairly generic steak and ale but given the decent size and amount of meat, I thought this pie was great value. Given that I suspected that I may not have cooked the steak & ale pie for long enough I popped in to Farmhouse to get another. This time the only small pies were Chicken, Ham and Leek so I grabbed one of these. Confusingly it had a Chicken & Mushroom sticker on it but cutting into it revealled it definitely was Ham & Leek. The amount of ham and leek was nearly perfect; there was just enough to add flavour whilst keeping the chicken the star of the show. I find too much ham can make a pie too salty. Having cooked the pie for longer the pastry was much better (and perhaps from a different batch). It was crunchy on the outside and gooey in the middle although perhaps a little too crunchy on top. The quality of the chicken was top notch, not at all processed. 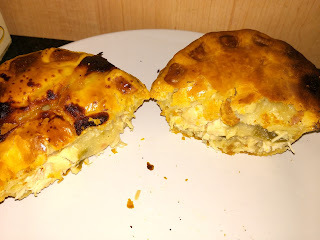 It showed that this was a pie from a butchers shop. It was filled with a thick sauce and held together so well that it was easy to eat it by hand. Overall this was a very enjoyable pie, even if it didn't do anything quite special enough to challenge at the top of our pie rankings. 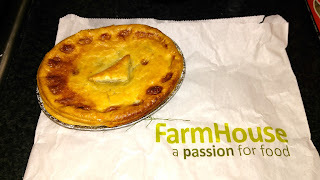 It will certainly inspire me to try more of the Farmhouse pies as I think they are good value at this price. 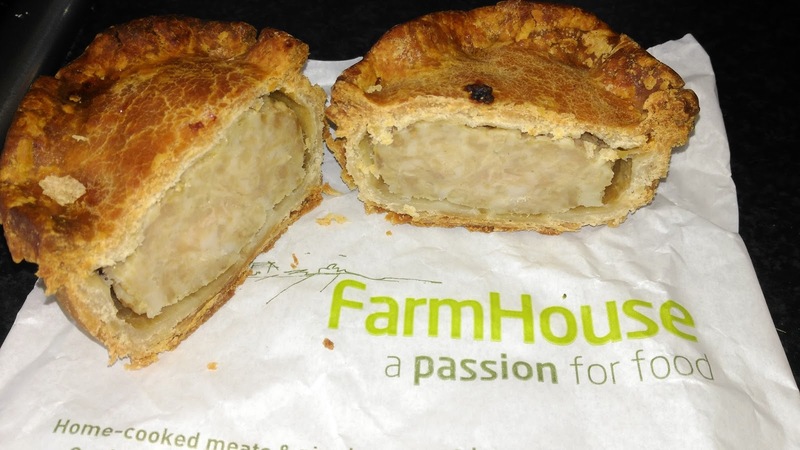 Pierate's Football Pie features on Channel 5! MyPie Steak a claim for the top London pie!